Update: check out our latest predictions for 2019! Each year, the search team at MBB makes predictions about the coming year (see predictions for 2017 and 2016). We try to answer the following questions: What updates to search engines are coming? How are users’ expectations changing? What can we do to stay ahead of the curve? Strategies that worked in 2007 aren’t going to cut it today (RIP meta keywords). However, there is one fundamental rule of search that has and will always remain true—if we optimize with the user in mind, we will succeed in search. As 2018 is beginning, I’ve gathered my predictions about what factors will have the biggest impact on search this year. So I know you’re thinking, “Uh, mobile experience has been on nearly every SEO predictions list for a while, is this really still relevant?” In short, yes! Google has been making algorithm updates to favor mobile-friendly sites since the beginning of 2015. So what exactly makes 2018 any different? In the past, Google has used both desktop and mobile crawlers to create two separate indexes of a website. Last fall, Google announced a mobile-first index. This means that in the future Google will only be crawling content from the mobile version of a site to index pages for both mobile and desktop devices. To prevent punishing all websites that aren’t mobile friendly all at once, Google plans to roll this out very slowly. At a prominent search conference earlier this year, Gary Illyes predicted 2018 would be the beginning of this rollout and that it will likely take several years. While it sounds like you may have a few years to perfect your mobile web experience for search engines, I’d recommend perfecting your mobile experience for users sooner rather than later. The percentage of mobile searches has continued to increase every year for the past ten years (Smart Insights). It’s a safe bet that this will carry on into 2018. Today, a good mobile experience means having content that’s easily accessible, optimized for a mobile device, and quick to load. Taking advantage of Google Accelerated Mobile Pages Project is also a great way to ensure a good mobile experience. Over the past several years, SEO professional’s have discussed the importance of publishing quality content. Because of this, more and more organizations are embracing a content strategy for their website. Nearly all content creators utilize keyword research and web traffic insights to develop new content with users in mind. This is a great way to get your site discovered in search in 2018, and I still recommend you do this. However, since your competitors are also likely doing this, search rankings are becoming more competitive than ever. After spending hours of time researching and creating content, you absolutely must go back to optimize for performance. Are users engaging with the content? What kinds of keywords do people use to find this content? Are users navigating to other relevant pages of your site? Is this content converting? Taking a look at these things will help you understand which pieces of content are working and which aren’t. In 2018, I strongly encourage you to audit the content of your website. Decide what stale content is worth keeping and how it can be improved. Use traffic insights to understand the types of content your audience finds helpful and expand on that content. A content strategy should not end after content is published, but rather should be an ongoing effort to ensure your content is relevant and helpful to your audience. You may have noticed that voice search is becoming very prominent in today’s digital world. More consumers are adopting voice search technology through smart phones, digital home assistants, and even cars. By 2020, it’s predicted that 30% to 50% of all searches will occur from voice search. Right now, optimizing for voice search really doesn’t look all too different than optimizing for regular search. Following best practices such as creating helpful, concise content and maintaining local listings will ensure that your content can be discovered through voice search. The biggest change in the coming year will be how we measure search performance. In years past, there have been very concrete key performance indicators for SEO: search engine rankings, click-through rate, organic search traffic, etc. With voice search, there are no search engine result pages, no click-throughs, and no web traffic. These KPIs are also changing for desktop and mobile device searches as well. Through featured snippets, users frequently don’t even have to leave search engine results pages to find the solution to their query. With Google Express, users don’t even have to navigate to an e-commerce website to make a purchase. In this new age, how are we able to truly measure search performance? Admittedly, I don’t have an answer to this million-dollar question, but I do anticipate that we’ll be given solutions in 2018. There are currently very limited capabilities to see voice search queries in Adwords, and I predict Google will be rolling out some reporting capabilities in Google Search Console or Google Analytics in the coming year. In the interim, we may see organic traffic going down as a whole, since more and more of these searches are taking place through voice search. 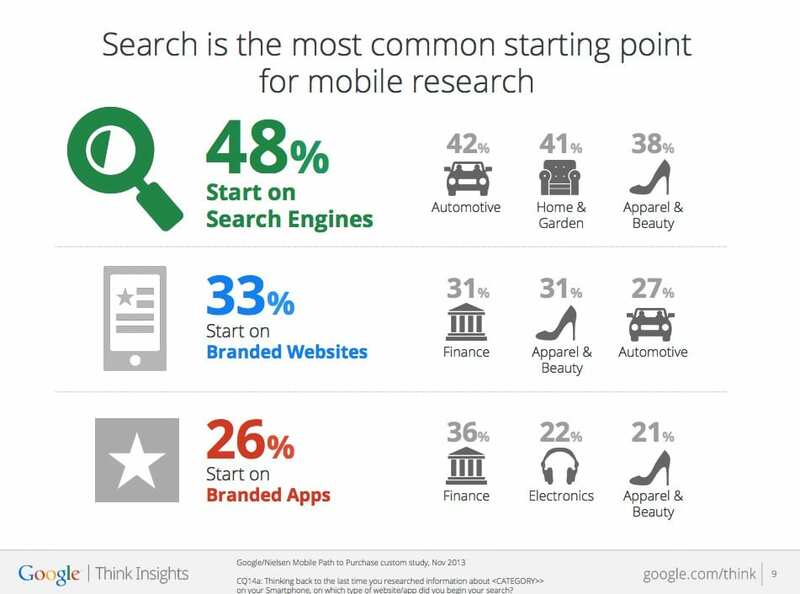 In 2017, 48% of consumers start mobile research with a search engine—but 33% go directly to the site (or app) they want (Smart Insights). Search engine optimization isn’t just for search engines anymore. For example, someone wanting to purchase a small household item goes directly to Amazon. Someone looking for ground beef recipe ideas goes directly to Pinterest. Someone looking for a home goes directly to Zillow. More and more searches are occurring in places other than search engines. In 2018, I highly recommend thinking about where else your products and services could be searched for online and put resources into optimizing content for these platforms. Each of these channels has its own best practices for optimizations, but ensuring content is accurate and up-to-date is a great starting place. Similar to the challenge of measuring voice search, defining performance indicators for these non-search engine searches is not black and white. Each channel has different intent; therefore, there will be different goals (whether that be sales, impressions, form completions, etc.). As search has evolved, search goals have also evolved. In summary, there are a lot of exciting changes coming to the search world in 2018. We know at times SEO can seem overwhelming and hard to stay on top of, but consistently pushing ourselves to be better and brainstorming new ways to meet a user’s needs is one easy way to succeed in search. Feel free to drop us a line if you have any questions or are looking to up your search game in 2018.